I love this curry. My family love this curry. This is delicious. 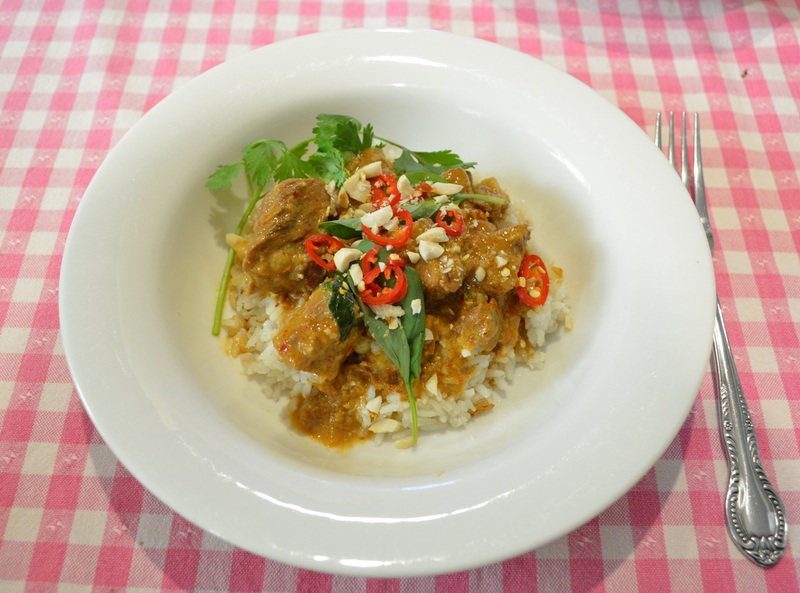 If you love the taste of a satay sauce, this curry will be one of the best things you have ever had. It has the most fabulous flavour, the hint of satay makes me enjoy every single bite, and what's best, it is so easy to make. Now I used a store bought curry sauce, because I could not find one of the ingredients from the fresh curry sauce recipe. But can I say it was fabulous, and the store bought curry sauce was brilliant. Once I make the curry paste from scratch (and I will one day) if I like it, I will post the recipe also. This is a curry that won't have you buying a million ingredients to make it, it is very simple. And you won't be left wondering what to do with the leftover ingredients. With store bought curry sauces, if you have any left over in the jar, smooth the surface of the curry paste and carefully pour a thin layer of vegetable oil to cover the surface completely, this makes it air tight and will prevent mould from forming until you need to use it again. 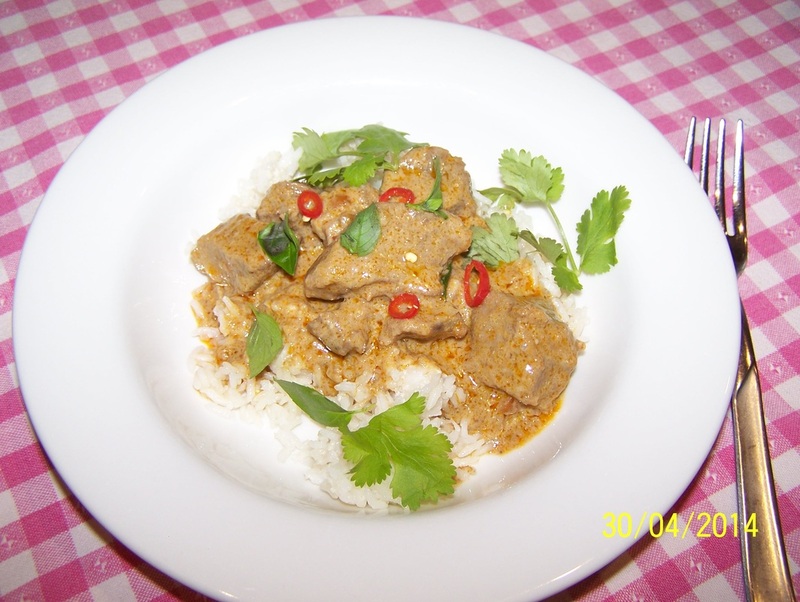 Please try this curry, it is just so nice and the aroma that spreads through the house while you are cooking it, is truly amazing. Preheat your oven to 130C. Combine 2 tablespoons curry paste and 1 and 1/2 cups water in an ovenproof casserole dish. Whisk to dissolve the curry paste. Add the beef and stir it through, the beef should be just covered with the curry water. Cover with a lid (or a double layer of aluminium foil) place on the stove top over medium-high heat and bring to the boil. As soon as it has come to the boil, place it in the oven, cook for 3 hours, or until the beef is very tender. Remove from the oven, reserve 1 cup of the cooking liquid (this is the beef stock in your ingredients list), then strain the beef. Rice cooker method: Rinse the rice under running water until the water runs clear. Place the rice, the coconut milk and 1 cup water in your rice cooker, season with a little salt. Turn it on, and let it cook. Once cooked, give it a little stir with a fork, then add the toasted coconut (if using), stir through with a fork, then leave in the rice cooker to stay warm, until needed. Stove top method: Rinse the rice under running water until the water runs clear. Place the rice, the coconut milk and 1 cup water in a heavy based saucepan, season with a little salt. Bring to the boil, uncovered, over medium heat. Cover and reduce the heat to low. Cook for 10 minutes, or until the rice has absorbed all of the cooking liquid. Remove from heat and stand, covered, for 10 minutes. Use a fork to stir in the toasted coconut (if using). Cover to keep warm. Heat a wok over medium heat until hot. Spoon the thick top layer of the coconut cream into the wok. Cook, stirring occasionally so it doesn't catch on the base, for 8 minutes or until the oil separates and the cream looks like it has curdled. (This process is known as splitting the cream, by doing this you really improve the flavour of your curry). Stir in the remaining 2 tablespoons of curry paste and the peanuts. Stir fry for 1-2 minutes, or until aromatic. Add the palm sugar and fish sauce. Gradually add the remaining coconut cream and your reserved beef cooking liquid. Simmer, uncovered, for 15 minutes or until the sauce thickens. Return the beef to the curry sauce, reduce the heat to medium-low. Simmer for 10 minutes, or until warmed through. Stir in the basil. Spoon the rice into bowls, top with curry, extra basil leaves and sliced chilli. Serve immediately.